For the 30 years since the original Star Wars movie, animated holograms have been among the geekiest of Holy Grails but little has changed due to the permanence of a holographic image once it has been written. 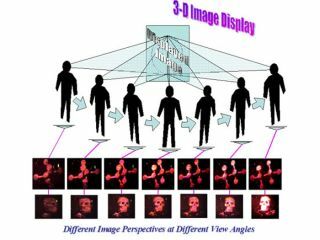 Now, a breakthrough from Nitto Denko Technical Corp promises moving images in three dimensions on a recording medium that can be refreshed as quickly as a normal non-holographic screen. The 15 x 10cm polymer created by Nikko's US labs can handle continually updating images thanks to the fact that it is rewritable. Conventional holograms are permanent once drawn. Although there are no plans for dustbin-shaped robots with holographic projectors anytime soon, Nitto suggests its technique will be useful in mapping, medicine, industrial design and any field that uses 3D modelling. More relevant to the man in the street, however, is a plan by the Japanese government to get 3D television up and running by 2025 - Nitto has already expressed an interest.